In a simple system featuring one audio interface with built-in mic preamps connected to a computer-based DAW, the interface clocks the DAW since the most clock-critical element of the audio chain is the A/D converter, as that’s built in to the interface. If you were to add an external digital device to the equation (reverb, multi-effects processor etc), it should be configured to work as a clock slave to the interface. Following that logic, even in bigger and more complex studios, it’s generally best to use an A/D as the master clock. If there’s more than one of these you’ll need to decide which one to use as the master, and everything else will have to be slaved to that. It’s quite possible that there will be audible differences between various configurations, because most A/Ds will perform slightly differently when configured as clock master and slave. External clocks are used in more elaborate systems with several A/D and digital outboard devices, making every device a slave to the centralized master clock. All master clock units provide numerous word clock outputs, and often several AES clocks too. Another situation where a dedicated master clock unit is essential, is in systems that have to work with, or alongside, video, such as in music-for-picture and audio-for-video post-production applications. It’s necessary here because there must be a specific integer number of samples in every video picture-frame period, and to achieve that, the audio sample rate has to be synchronized to the picture frame rate. Using a clock in the studio establishes synchronization of all digital effects processing units, the AD/DA converters and, if applicable, a digital desk. The simplest scenario and setup is: if the built-in clock of the converter is reliable and stable, it should be the master clock and all other devices that are slave devices. Alternatively, a stand-alone external clock, which is proven to be ultra stable, should be the clock master, distributing the clock source to all other digital devices. The use of more advanced external clocks are applied to more complicated setups. A larger studio with three control/live rooms, a mastering suite and a mixing room, can all be clocked with an external clock that is able to distribute different sample rates simultaneously. In this example, the Antelope Audio Isochrone 10M, a 10Mhz reference rubidium atomic clock, is clocking Antelope Audio’s Isochrone Trinity via BNC. The Trinity is then feeding the converters (Orion32) in three different control/live rooms with three independent sample rates. The clock source can be distributed through the Orion to the rest of the rooms digital equipment. 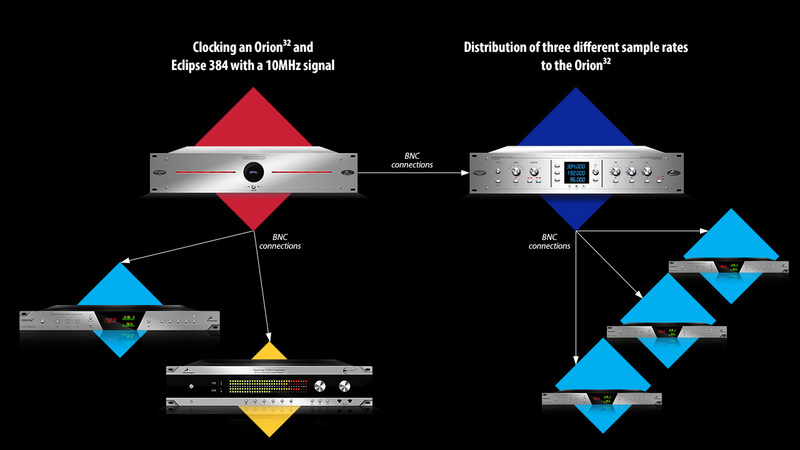 The Isochrone 10M, is also distributing a different Orion32 directly, representing our mixing room, and an Eclipse384 which is in our mastering suite. All connections are achieved via BNC cables. As previously mentioned clocks are used when dealing with audio-for-video, for sound design and soundtrack composition. This establishes a syncronisation between the video generator and the audio generator, ensuring that both media files are linked and syncronised. The sample rate is dependent on the frame rate and video format. The connectivity that applies in such scenarios, requires an external master clock, which allows sample rate pull up/down and video connectivity. At first the video generator will supply the word clock with a reference signal, and in turn the master clock distributes the clock source to the converters, the DAW and mixer. In live sound engineering, the use of a master clock is essential when a digital desk is installed, which is in most cases as engineers like to save their presets when mixing for festivals or a touring band. The clock will ensure synchronization between the desk, the converters and any digital outboard effects units. Connectivity is simple in this case, as the master clock is distributing the source to the slaves (digital desk, converters and outboard units).